At least seven locations recorded their all-time warmest March in 2019: Utqiaġvik (average temperature for the month of 5.9 degrees Fahrenheit), Fairbanks (27.6 degrees), Nome (23.8 degrees), Bethel (30.5 degrees), McGrath (27.3 degrees), Kotzebue (23 degrees) and Bettles (18.5 degrees). 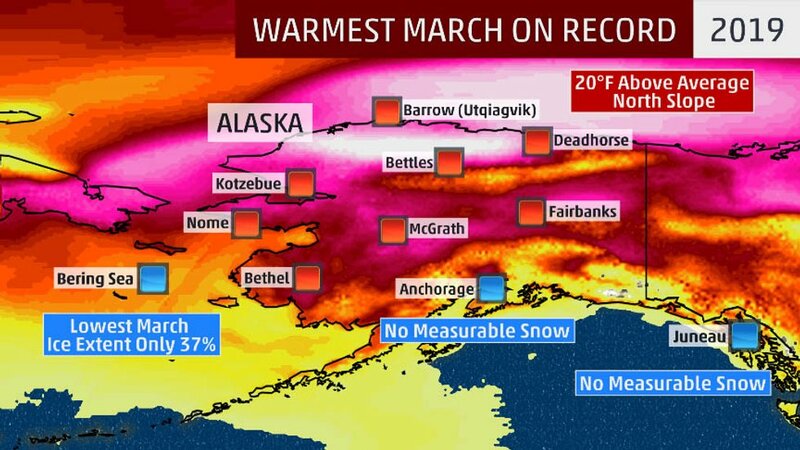 Parts of Alaska crushed their all-time warmest March on record in 2019. Utqiaġvik's average temperature of 5.9 degrees was 18.6 degrees above the 30-year average and 6.6 degrees higher than the previous warmest March, which happened to be in 2018. The town has seen eight of its 10 warmest Marches since the mid-1990s, according to Rick Thoman, climate science and services manager for the National Weather Service Alaska region. Across northern Alaska and far northwestern Canada, temperatures averaged through March ran 20-plus degrees above normal. This is likely the biggest departure from average recorded for any month in that part of North America, as Alaska-based climatologist Dr. Brian Brettschneider pointed out in a tweet. On the Alaska Peninsula, Cold Bay measured its warmest January-to-March period on record, with an average temperature of 35.4 degrees over those three months. King Salmon recorded its second-warmest March, with an average temperature of 35.8 degrees. On March 19, Alaska's earliest-ever 70-degree temperature was recorded in Klawock, some 300 miles south-southeast of the capital city, Juneau, in the Alaska Panhandle. Klawock's average high in mid-March is in the lower to mid-40s. Yakutat, some 200 miles northwest of Juneau, reached 60 degrees both March 19 and 26, setting records for its warmest March day on record. Average highs there are only around 40 degrees that time of year. For just the second time on record, Anchorage received no measurable snowfall (0.1 inches or greater) in March, a month that averages 9.9 inches of snow. Officially, a trace of snow was observed in Anchorage last month. The only other time this happened was in March 1983, when a trace was also the tally for the month.